East German soldier helps a little boy sneak across the Berlin Wall, August 13, 1961. This is a photograph of an East German soldier helping a little boy cross the newly erected Berlin Wall the day it was built. A boy who’d gotten left behind in the chaos of people fleeing and families caught on different sides of the border. The soldier is young, and his eyes, looking warily over his shoulder, are full of fear. And yet, he persisted. 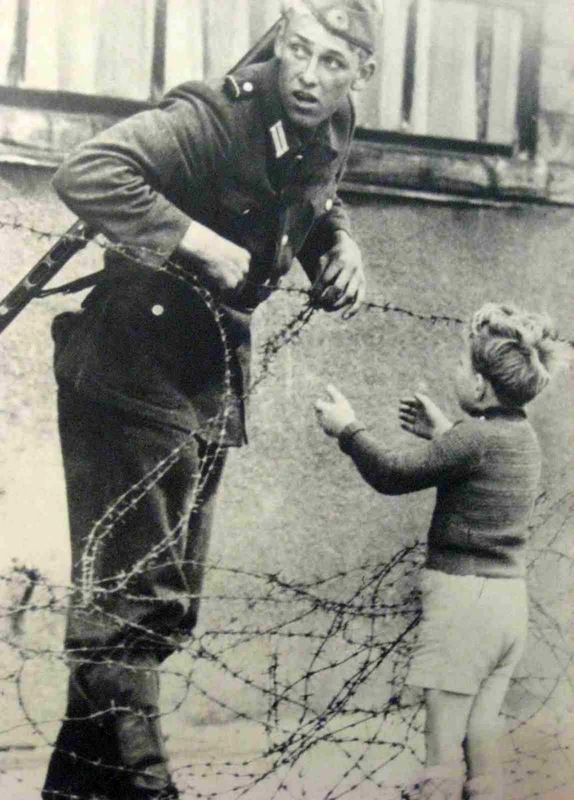 Despite being given orders by the East German government to let no one pass into East Berlin, the soldier helped the boy sneak through the barbwire. It was reported that the soldier was caught doing this benevolent deed by his superior officer, who removed the soldier from his unit. Hopefully his punishment was minor and he wasn’t imprisoned or shot. Descriptions of this photo come with the caveat that “no one knows what became of him”. But how did this little boy end up on the opposite side of the wall from his parents? According to Checkpoint Charlie Museum in Berlin, one of the boy’s parents, his father, was with the boy in West Germany visiting relatives while the rest of the boy’s family was at home in the East. The prohibition against crossing sectors did occur overnight thus separating this family. The father believed that the boy should grow up with his mother, so he had the boy walk to the fence where this soldier lifted him across. On the night between the 12th and the 13th of August 1961, the police and units of the East German army began to close the border and, by Sunday morning, the border with West Berlin was closed. East German troops and workers had begun to tear up streets running alongside the border to make them impassable to most vehicles and to install barbed wire entanglements and fences along the 156 kilometers (97 miles) around the three western sectors, and the 43 kilometers (27 miles) that divided West and East Berlin. The barrier was built inside East Berlin or East German territory to ensure that it did not encroach on West Berlin at any point. Generally, the Wall was only slightly inside East Berlin, but in a few places it was some distance from the legal border. Later, the initial barrier was built up into the Wall proper, the first concrete elements and large blocks being put in place on 17 August.